Born to fly is a novella based on the methods and life of Cath McCarthy, a mothercraft nurse with experience taking care of "emotionally detached" children. It's clear from the outset that names and ages have been changed and that many of the background descriptions are fictional but that the methods and responses are not. The novella format makes this story interesting and very easy to read. It can be read as a period drama with a very helpful message. The story is told as a story within a story, essentially a journalist interviewing Ms McCarthy. It starts in rural Australia in 1946 with the birth of Jamie, a boy who is later diagnosed with "gross mental deficiency", a term used before autism was widely accepted. His parents are told by their doctor that "there can be no correction or improvement in his behaviour. He will never walk, talk or feed himself" and Jamie is committed to an asylum for the rest of his life. To say more would ruin an amazing story but Jamie's story might have ended there had it not been for the appointment of a temporary nanny whose real life "miracles" would put Mary Poppins to shame. Born to fly is an amazing and emotional book which sheds a great deal of light on the way things used to be done and highlights methods which are still effective today. I tried to take this book slowly to savour it but it was so good that I blazed my way through it in two days (and even then, only because I was required to stop reading for family time). I can't recommend thus book highly enough. It is suitable for anyone who wants a great uplifting read but it would be an especially great treasure to give someone who has just received news about their child. You can read the press release for Born to Fly here. Born to fly is currently available in paperback with an eBook due in late 2014. 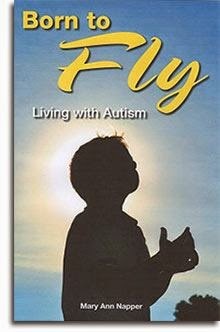 You can purchase it from the website at http://www.borntofly-livingwithautism.com.au/. Money from the sales of paperback copies of this book go to Autism Spectrum Australia (ASPECT). Honesty clause: I was given a copy of this book for review purposes free of charge.